The Mark West watershed drains approximately 40 square miles of land, and includes approximately 47 miles of blue line stream. The watershed is located in Sonoma County, east of the cities of Santa Rosa and Windsor. Mark West Creek joins the Laguna de Santa Rosa about five miles upstream of the Laguna’s confluence with the Russian River. The major tributaries of Mark West Creek include: Humbug, Mill, Porter, Van Buren, and Weeks Creeks. . 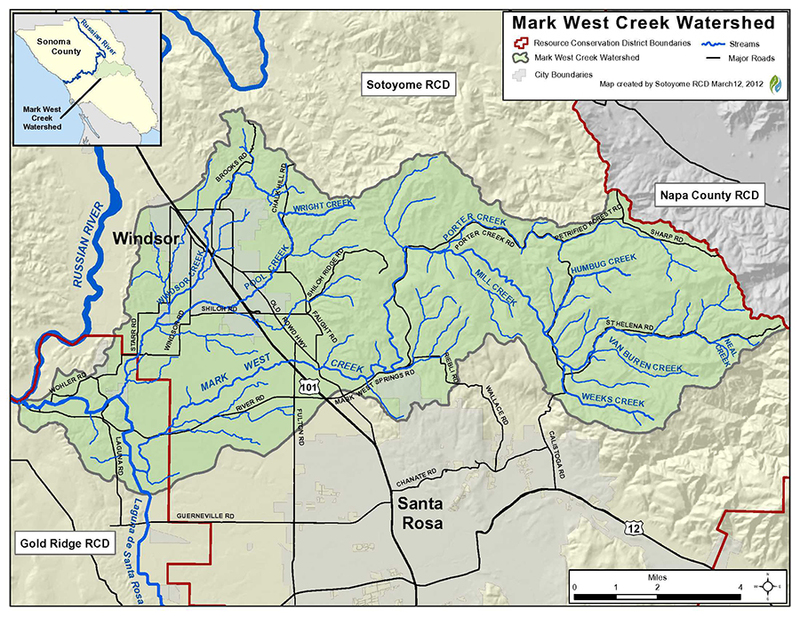 According to the U.S.G.S topographic maps, the Laguna de Santa Rosa and Windsor Creek officially empties into Mark West Creek, and it’s the Mark West Creek that empties into the Russian River not the Laguna. This is because the lower reach of Mark West Creek was diverted and moved about 2 miles southward sometime between the late 1800s or in the early 1900s to accommodate the railroad and to prevent flooding. Today, however; most people consider that Mark West Creek flows in to the Laguna about five miles upstream of the Laguna’s confluence with the Russian River. For more information please refer to the Laguna Watershed Page for a link to a useful document titled “Draining and Filling of the Laguna de Santa Rosa” by John Cummings (2004). The watershed ranges in elevations from about 40 feet at the confluence with the Laguna de Santa Rosa to 2,240 feet in the headwaters in the Mayacamas Mountain Range. Although it’s not an official designation, the RCD breaks Mark West into upper and lower watershed areas roughly at the Mark West Spring Lodge, along Porter Creek Road. Here in the watershed, there is a change in the geology, hydrology, degree of urbanization, and ecology. The lower part of the watershed is highly urbanized and contains the areas of Larkfield-Wikiup and the Riebli-Wallace Neighborhood east of Highway One. West of Highway One, the landscape is defined by a dominance of vineyards and other agricultural lands with no other large urban centers. River Road essentially runs through the center of the watershed all the way to the Russian River. The upper part of the watershed is characterized by rural residential properties with about 5-7% of the area composed of small scattered vineyards or other agricultural uses. The two main points of access are Mark West Springs Road which turns into Porter Creek Road and Saint Helena Road. Both routes connect to Calistoga Road which continues to Napa County. The upper watershed is mountainous with curvy roads that cut through a mosaic of vegetation types. The total watershed is about 94% privately owned. The upper watershed includes a small area of Bothe Napa Valley State Park which is owned by the State of California and can be accessed by the public from Highway 128 in Napa County. 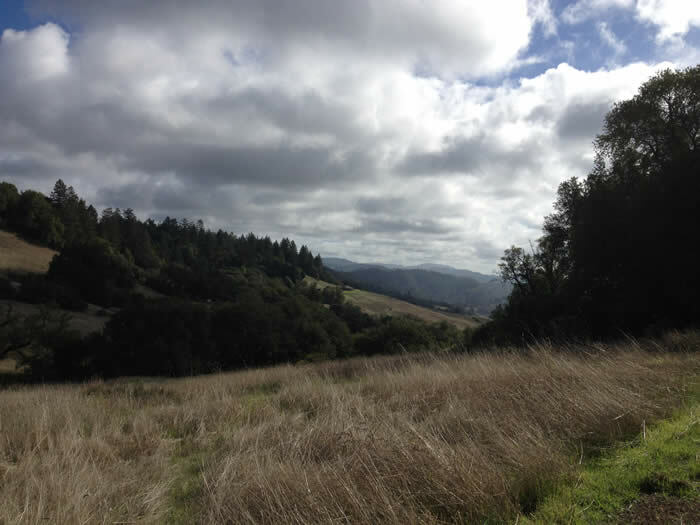 In addition, there are multiple properties owned by the Sonoma County Agricultural Preservation and Open Space District including the Saddle Mountain Preserve and the Cresta and McCullough Ranch which may in the future be transferred over to Sonoma County Regional Parks. There are other lands with recreational and educational opportunities through the Pepperwood Preserve, Rancho Mark West, Safari West, a wildlife preserve showcasing African animals, and the Mayacamas Golf Club. During the late 19th and early 20th centuries, land uses in the Upper Mark West watershed were largely focused around ranching and timber harvest. These land uses are still in place today, though to a lesser degree. Within the lower portion of the watershed, land use was focused on farming row crops, hops, and prune and apple orchards. Vegetation is very diverse between the low lying areas west of Highway 1 and to the headwaters in the Mayacamas Range. The upper areas of the watershed are composed of rolling non-native and native grasslands that integrate with coniferous forest, oak woodland and chaparral habitat. Within the lower portion of the watershed, the dominant plant community is riparian habitat associated with Mark West Creek that is generally confined by rural or residential properties and agriculture. Coho Salmon (Oncorhynchus kisutch) and steelhead (Oncorhynchus mykiss) are present in Upper Mark West Creek and its tributaries. Wild Coho Salmon were observed in 2001 by DFG during a snorkel survey and most recently in the fall of 2011 by UC Cooperative Extension (UCCE) and DFG during multiple surveys. Now, more than ever, this watershed is a focus to improve and enhance fisheries habitat. The fall of 2011 was the first year that the Russian River Coho Salmon Captive Brood Stock Program released hatchery salmon in to the Mark West Watershed. In addition to salmonids, Rana draytonii (CA red-legged frog) and Rana boylii (yellow- legged frog) which are both listed as threatened have been documented in the watershed. The RCD has worked with many agricultural producers in the Mark West Watershed to enhance their farming operations and protect soil and water resources. Projects include the development of LandSmart Plans, implementation of frost protection alternatives, enhancement of riparian areas, erosion control, and hedgerow plantings. landsmart.org. Maacama and Mark West Integrated Watershed Management Plan: The RCD has developed a comprehensive Integrated Watershed Management Plan for the Upper Mark West and Maacama Creek Watersheds. This plan integrates and updates the draft Upper Mark West Management Plan and the completed Maacama Watershed Plan. A copy of the watershed management plan is available on our Resources page. The RCD is continuing to work throughout both watersheds with interested landowners to address resource management concerns. The goal is to investigate and evaluate current and historic conditions and recommend a prioritized set of actions and programs to improve water quality and riparian and aquatic habitat conditions in the watersheds. In 2013, the RCD worked in collaboration with the Pepperwood Preserve and the City of Santa Rosa on a sediment reduction project in the Mark West Creek Watershed. Through this project improvements were made on 3+ miles of unpaved road and 26 stream crossings, preventing more than 3,100 cubic yards of sediment delivery from entering Mark West Creek. The development of riparian enhancement plans: The RCD is actively working with landowners to develop and implement projects to enhance the creek and stabilize eroding stream banks. The purpose of this work is to improve the quality and extent of the riparian habitat and keep viable the surrounding property on rural residential and agricultural lands. In 2011, the RCD worked in collaboration with the Sonoma County Agricultural Preservation and Open Space District (SCAPOSD) and Friends of the Mark West Watershed to secure funding for a two-day planting project. This project incorporated local high school students from the RCD’s FARMS Leadership program in the installation of 200 native riparian plants on the Cresta Property along Mark West and Porter Creeks. Road Assessments and erosion control and road maintenance plans: Between March 2006 and September 2007 the RCD implemented the Upper Mark West Creek Sediment Reduction Project. Through this project road improvements were carried out on 12 miles of unpaved road involving over 70 landowners preventing approximately 14,000 cubic yards of fine sediment delivery from entering the creek over the decade. FARMS Leadership high school youth education programming and restoration project implementation on school field days. Partnered to put on a Coho Celebration Event at the Pepperwood Preserve to highlight the return of wild coho in the watershed and other related work being carried out. Collaborates with local landowners and watershed partners to host LandSmart Workshops and Agricultural Heritage Series public outings. The RCD has helped provide public access to private Open Space conservation easement protected lands in the watershed by leading outings and participating in partner outings at properties such as Saddle Mountain and Cresta. The RCD is one of six partners in the Russian River Coho Water Resources Partnership (Partnership), a National Fish and Wildlife Foundation Coho Keystone Initiative (cohopartnership.org). The Partnership was formed in 2009 to develop a systematic approach to improve streamflow and water supply reliability in Mill, Grape Creek and Mark West Watersheds and three other sub-watersheds critical to coho recovery in the Russian River watershed. The Partnership’s goals are to further the recovery of coho salmon through habitat and streamflow enhancements and improve water security for property owners. “Slow it, Spread It, Sink It, Store It!” (View & Download PDF) practices are implemented with landowners throughout the watershed. These practices can help to protect and replenish groundwater resources, reduce erosion and pollution, prevent flooding and increase water conservation and stormwater management. In 2015, the RCD in collaboration with watershed partners began a landowner outreach effort for the implementation of rainwater catchment systems. The RCD has fourteen potential sites for tank installation, some of which are planned on actively managed forest land. These projects are intended to replace the use of groundwater in the summer months with rainwater captured during the winter. Stay tuned for more updates in 2016. For more information about the Mark West Watershed please contact Jeff Schreiber at 707.569.1448 ext 110 or jschreiber@sonomarcd.org.